Time to set some rules! 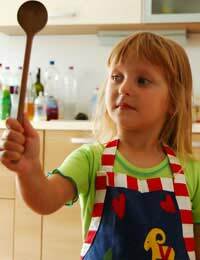 Before you start cooking with your Children’s Cookery Group you’ll need to know some very important safety rules. The following guidelines will help you to make a start; with your group, brainstorm some more rules and make your own Hazard Handbook! Health and Safety isn’t the most thrilling topic you’ll cover at Cookery Group – but it’s the most important, so try to make it a fun activity. You could start with a basic set of rules and ask your group members to talk about accidents they’ve had or witnessed, discussing the safety rules that you should have as a result. Has anyone ever slipped in a puddle, or burned their fingers or mouth? Try to relate the safety rules to things that the children understand. At the end of your discussion, you could get the children to illustrate some rules and bind the pictures into a Hazard Handbook – a unique document that each child can take home. Knives: Use sharp knives when you’re chopping – they’re safer than blunt ones! When you carry a knife, make sure it is pointing downwards. When you’re chopping, make sure that your fingers are tucked away so they don’t get sliced! Fire safety: Fire hazards include tea-towels (make sure they’re always hung up away from the oven), sockets (never touch them with wet hands; ideally, use socket covers whenever you don’t have something plugged in); and saucepans on the hob. Make sure you know where the fire extinguisher is located, in case of a pan fire. Oven and hob safety: Wear an apron to protect yourself against spatters from the hob. If you need to use the oven or hob, ask an adult to help. If you’re melting chocolate or boiling anything, be very careful and don’t lift the pan. Make sure all saucepans have their handles pointing inwards (away from the edge of the hob). High temperature safety: If you need to lift something that might be hot, use a dry oven glove – never use a wet cloth, because it will get hot more quickly! Liquids boil at around 100 degrees C, but fat (like butter and cooking oil) reaches higher temperatures and sugar also gets very, very hot. Don’t forget that steam can be really hot too – so take care with a steaming pan. If you have cooked something with lots of sugar in it, be very careful to let it cool thoroughly before tasting. Electric safety: Electric appliances often have dangling wires – but these must be kept out of the way in a busy kitchen. Make sure that wires are never hanging over the worktop or obstructing a cabinet door. Washing hands: A stool at the sink and a squeezy bottle of antibacterial handwash will make hand-washing a bit more fun. Don’t forget that your hands might not stay clean! If you pet the dog, sneeze, or use the toilet, make sure that you wash your hands again straight afterwards. Raw meat: Raw meat can contain harmful bacteria (which are killed when you cook the meat). It’s important to keep raw meat and fish away from cooked foods. After chopping or preparing raw meat, wash your hands and chopping board very thoroughly. Using separate chopping boards for fruit and meat helps to isolate harmful germs. Cooked food: When you’re storing cooked food, it’s important to let it cool down before wrapping it and putting it in the fridge – on a shelf ABOVE raw foods. Raw food should always be in the bottom part of the fridge, so that it won’t contaminate cooked items.